1. Son of Ishmael (Gen. xxv. 14; I Chron. i. 30). Suḳ ("marKet") Dumah has been found in Dumat al-Jandal in Arabia, called "Jauf" to-day (Yakut, s.v. ; Burkhardt, "Travels in Syria," p. 662), and compared with Domatha (Pliny, "Historia Naturalis," vi. 32; Stephanus Byzantius, s.v.). The Dumathii are mentioned in Porphyry, "De Abstinentia" (ii. 56), as an Arabian tribe which sacrifices a boy every year and buries him under the altar of its idol. The name "Dumah" seems to point, like the name "Hadramaut ( , Gen. x. 26), to some legend of Hades (compare Glaser, "Skizze der Gesch. und Geographie Arabiens," 1890, p. 440). 2. Name of a land probably identical with the territory of the tribe of Ishmael (Isa. xxi. 11). The Septuagint substitutes "Idumea" (see commentaries ad loc., and comp. Abu al-Walid's "Dictionary," s.v. ). 3. Name of a city of Judah (Josh. xv. 52). The Ginsburg MS., the Vulgate, and the Septuagint have "Rouma," but Jerome's and Eusebius' Onomastica, s.v., mention a village of the name of "Dumah," which has been identified with "Khirbat Daumah" in the neighborhood of Bait Jibrin. 4. Name for the nether world (Ps. xciv. 17 [the Septuagint has Αδης], cxv. 17). "Dumah" is the name of the angel who has charge of the souls of the nether world. According to Dozy ("Die Israeliten in Mecca," p. 95, note), the name was adopted also by the pre-Islamic Arabs (compare Wolff, "Mohammedanische Eschatologie," 1871, Arabic text, p. 39; German trans., p. 69, where "Ruman" seems a corruption [another reading is "Dhudat"] of "Dumah," as the name of the angel who has charge of the souls). The angel of death has to deliver all souls to Dumah, both the righteous, who are led to the place of eternal bliss, and the wicked, who are to meet their doom (Ḥag. 5a; Shab. 152b). He also announces the arrival of newcomers in the nether world (Ber. 18b). Dumah takes the souls of the wicked and casts them down "in the hollow of a sling" into the depth of Hades, and this is repeated every week at the close of the Sabbath, when the souls, after the day's respite, must go back to their place of torment (Shab. 152b, after I Sam. xxv. 29; Pesiḳ. R. 23; She'eltot, Bereshit i.). According to Midr. Teh, to Ps. xi. (see ed. Buber, 102, note), Dumah leads the spirits every evening out of Hades into Ḥaẓarmavet (the Courtyard of Death), a walled place with a river and a field adjoining, where they eat and drink in perfect silence. Many authorities, such as Jacob Tam and Solomon b. Adret, have the word "Sabbath" added, so as to refer only to Sabbath evening (see Demonology; compare Tan. Yelamdenu, Ha'azinu: "Prayer is said for the dead that they may not have to return to Gehinnom"). 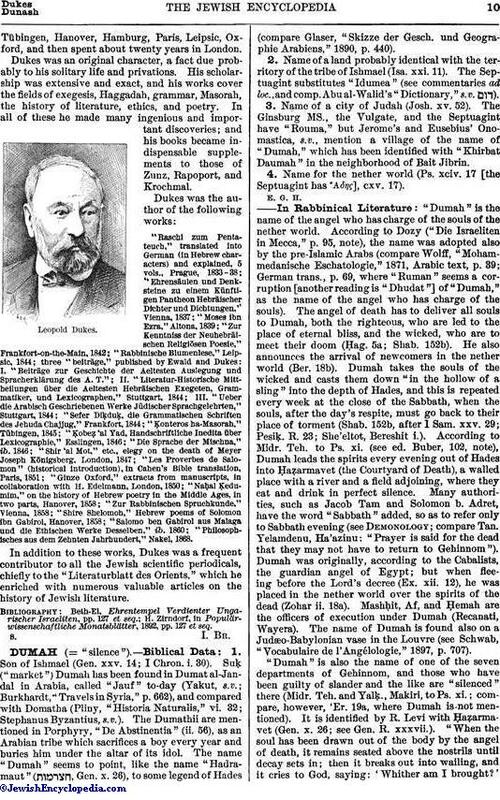 Dumah was originally, according to the (Cabalists, the guardian angel of Egypt; but when fleeing before the Lord's decree (Ex. xii. 12), he was placed in the nether world over the spirits of the dead (Zohare ii. 18a). Mashḥit, Af, and Ḥemah are the officers of execution under Dumah (Recanati, Wayera). 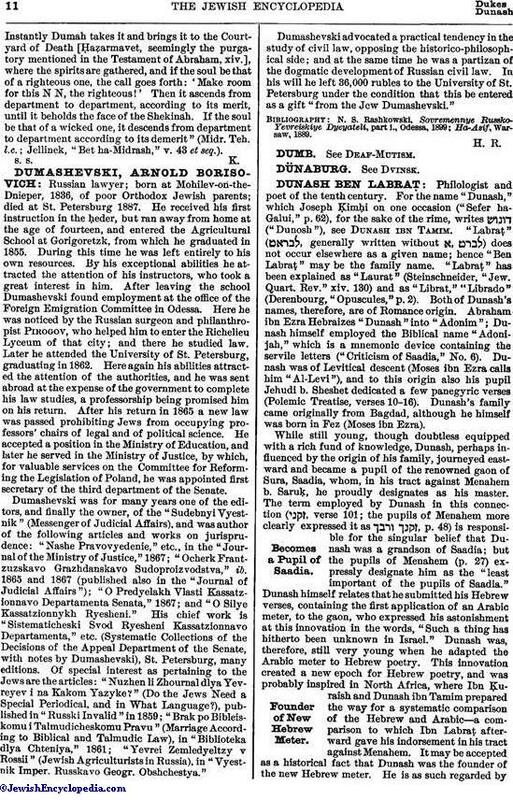 The name of Dumah is found also on a Judæo-Babylonian vase in the Louvre (see Schwab, "Vocabulaire de l'Angélologie," 1897, p. 707). "Dumah" is also the name of one of the seven departments of Gehinnom, and those who have been guilty of slander and the like are "silenced" there (Midr. Teh. and Yalḳ., Makiri, to Ps. xi. ; compare, however, 'Er. 19a, where Dumah is not mentioned). It is identified by R. Levi with Ḥaẓarmavet (Gen. x. 26; see Gen. R. xxxvii.). "When the soul has been drawn out of the body by the angel of death, it remains seated above the nostrils until decay sets in; then it breaks out into wailing, and it cries to God, saying: 'Whither am I brought? 'Instantly Dumah takes it and brings it to the Courtyard of Death [Ḥaẓarmavet, seemingly the purgatory mentioned in the Testament of Abraham, xiv. ], where the spirits are gathered, and if the soul be that of a righteous one, the call goes forth: 'Make room for this N N, the righteous!' Then it ascends from department to department, according to its merit, until it beholds the face of the Shekinah. If the soul be that of a wicked one, it descends from department to department according to its demerit" (Midr. Teh. l.c. ; Jellinek, "Bet ha-Midrash," v. 43 et seq. ).